It’s a bit later than I intended, but given a choice between restfully enjoying Eid at home in Trinidad and using precious hours and the family bandwidth to blog…I chose the celebration But we took pictures, so there would always be time to blog at our leisure. Lilandra beat me to it anyway. Darned work. But back to the joy! Eid ul Fitr celebrations may sometimes seem to be all about food. It isn’t entirely, because there’s prayer and community and family…but it does all tend to accompanied by food! That’s only natural of course, since it’s at the end of the month of Ramadan, the month of fasting from dawn to sunset. And in any event what kind of celebration can one have, whether it be a wedding or a reunion, without food. Even though we had a relatively quiet Eid in terms of visitors and activities (Mom and Lilandra didn’t know I would be there to possibly help out with more) we still planned the menu in advance and made dishes that required sometimes elaborate prep. It’s all part of the Eid feeling – making special dishes no matter how big or small the group of diners will be. For me, that preparation is what makes it feel like an occasion more than the actual eating on the day. Joy in the groundwork served me well as I flew into Trinidad (after taking 12 hours to travel from Northern Jamaica to Trinidad) on Thursday night, for Eid that was expected to be on Saturday. Of course I didn’t go to sleep early upon arrival in la casa familial, but I nonetheless made sure to fast on the Friday, the last day of Ramadan. And as mentioned in a previous post, fasting during Ramadan does not preclude intensive work in the kitchen. Mom and Lilandra already planned the menu for the day before and the day of Eid, and both had started implementing already (Lilandra made the basboosa on Wednesday and Mom started putting the kibbe together so we could just bake it on Saturday). We didn’t do some of the more traditional dishes or sweets that our family generally prepares (gulab jamoon, barfi etc) since it was not going to be a big Eid for us this year. But Eid still requires work in advance. So, naturally on Friday I started to do my fair share. I made the scalloped potatoes and the oven BBQ chicken (love broilers when you can’t fire up the charcoal) so we’d have a special enough dinner after the last fast of Ramadan, which as we said, is really the first meal of Eid ul Fitr. I may have to get around to posting the scalloped potatoes recipe at some point, since I was really pleased with the way it came out. I used a white sauce with ricotta and cream cheeses and egg, seasoned with garlic of course. Potatoes sliced really thinly and layered with some pepper and paprika and sautéed onions. Top off with cheddar cheese for the golden brown goodness and bake slowly. Slowly, for a really long time until the potatoes are tender. Tip for those who may not know – when making delicious lasagna and scalloped potatoes, let them rest for a while before eating. Scalloped potatoes can tend to have a lot of liquid, but when they settle and cool a bit, the tender potatoes soak it all in. So good. Even if I say so myself. But I left out the mushrooms Mom and Lilandra wanted. Found them on the table when I was cleaning up. Oh well. Later that evening, Lilandra and I made the baklava and asabieh. 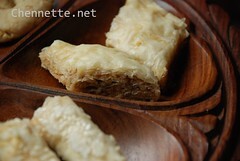 Phyllo pastry, nuts and sugar. Those are the basic ingredients In varying forms and ways. The phyllo was a joy to work with that night. We have had some experiences in the past with this paper thin pastry, that needs to be prevented from drying (or it cracks) but not too moist (then it mushes together). This year, however, the pastry was the right texture, and worked so easily. It was even the right size for our bigger baking sheet. 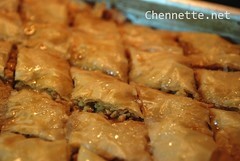 The baklava is made with layers of this phyllo brushed with melted butter and a mixture of nuts, cinnnamon and sugar. After it bakes, you pour an orange-blossom flavoured thin syrup all over the hot crispy golden pastry. The best baklava should have light and crispy pastry, with gooey insides. Awww, the best. Really. 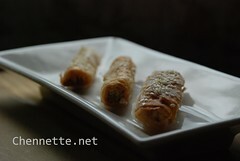 The asabieh is like baklava rolled in cigar shapes. We filled it with almonds, rolled it, and when baked, dip in syrup and cover in toasted sesame seeds. So good we decided we’d make almond baklava next time instead of the walnut we usually use (unsalted pistachios are impossible to find). 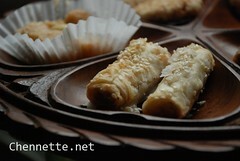 You will note that the sweets were primarily those Middle Eastern ones – basboosa and baklava. 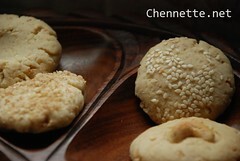 Mom also wanted to make nankathai, which is a rich buttery cookie of Indian origin, commonly including some nuts. We loaded them with lots of nuts. Could have used a bit more butter, or maybe ghee, but they were good anyway. Nuts have their own lovely sweetness and flavour that just make things so good. We kinda had nuts in all our sweet treats. Even the sawine had ground almonds (no pictures yet, but this weekend I hope to make for sister the elder and I to continue Eid celebrations)! We need to separate the almond processing from the other nuts next time, for our cousin’s son who dropped in briefly. And is allergic to those other nuts. As for the savoury stuff on Eid day, all I needed to have was biriyani and I’d be happy. 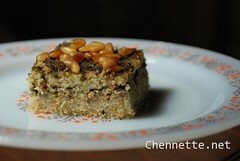 But Mom also made lamb kibbe, with lovely toasted, glowing pine nuts on top. Gorgeous. And it was really good. And the lamb biriyani was excellent. And not burnt. 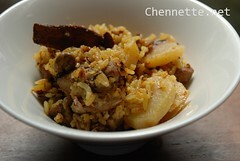 Mom had fears, but it was just the usual bun-bun that I enjoy from any good rice dish. Mmmm. The only thing I would have liked is a spicier (heat) biriyani, but then Dad wouldn’t have enjoyed it. Compromise. It’s what family is about. There are perks though – Dad doesn’t like melted cheddar, so when dishing out his scalloped potatoes, I got to take his golden cheesey crust! 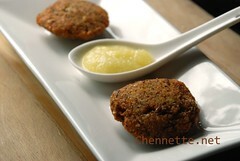 We also had falafel made from ground channa (chickpeas/garbanzo beans) and brown lentils. 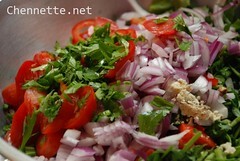 With lots of fresh green herbs and some geera (cumin). And Lilandra made fa’toush, which is a Syrian salad with bits of flat bread in it. 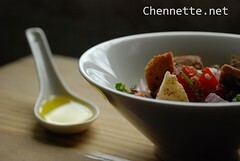 This version had lettuce, red peppers, red onions, water cress, celery, cucumbers, and shankleesh, with za’atar pita chips. Although I didn’t eat it, it was truly gorgeous. And the pictures I took of it finally make me think I am making headway with the D80. Actually doing something with it that I intended! Yay. (You will note that we tried our hands at food styling, and Lilandra’s “oriental” set came in really handy). The best part of Eid is sharing the food though. And having friends and family visit. An uncle who lives in Florida had to be in Trinidad and spent Eid night and day with us, happily staying in the kitchen till late to make sure he saw every step in the baklava and nankathai process. Drinking freshly made barbadine with condensed milk. And tasting of course, before going to sleep. Other uncle and aunts visited after Eid prayers, who may not always have room for a meal, but you get to tempt them with treats (provided they’re not allergic of course…). And my good good, longtime friend and visitor on Eid day since we were in Form Three, TB. Yay. I hadn’t seen her in months so it was good catching up. And it made Eid even more Eid. We packed up food and treats for our evening visitors (son of a family friend who cannot miss his sawine, but also visited to bring his ever-so-cute 15-month old to experience some Eid!) and were not too tired at the end of the day. As I go, please enjoy some more views of the sweets in a new mahogany sweet tray I bought in Jamaica for Mom for Eid. I love the colour. And visit my Flickr or Lilandra‘s for more pics. Eid Mubarak! 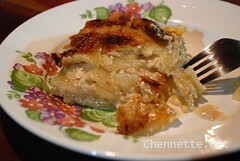 October 22 2007: Edited to add a photo of that quintessential sweet dish that signifies Eid for all Trinis, Sawine. Made from vermicelli noodles that have been browned in a pot (parched) with cloves, elaichi (cardamom) and spice (cinnamon). The vermicelli is then boiled in lots of water with some sugar until al dente (it remains in hot liquid and gets softer). Evaporated milk, condensed milk and equal part water is also boiled and then added to the sawine. Serve with ground nuts, and if you really really have to, raisins or maraschino cherries). This entry was written by Chennette and posted on October 19, 2007 at 1:31 am and filed under 'Id, Chennette, Eid ul Fitr, family, food, life, photos, Ramadan, Trinidad and Tobago. Bookmark the permalink. Follow any comments here with the RSS feed for this post. Post a comment or leave a trackback: Trackback URL. You didn’t tell them how you took all the baklava with you! Hmph. Didn’t leave an asabieh for me. Shukran( thanks) for being here and helping with the cooking , as we would not have been able to manage ….two sick persons who cannot seem to shrug off the virus………. Its not an Eid celebration if its not spent at the Ali residence, thanks for the annual invitation – its always a gastronomic delight filed with family and fond recollections! Ms. Tamarind Ball, we await words just like those at your own forum. Perhaps a travel blog? Tales both spicy and sweet from the Rolling Tamarind Ball…if you start it now, you can report on Guyana next month! oh wow! you guys had a blast! Alhumdulillah, our eid this time was one of the best too. We had an eid party and then a BIG party the day after…and then another party mid-week! So, it was fun all the way….the only sad part was the food got over quickly because we had a lot of people! it was a blast, but we didn’t have any big parties like you did 😀 just family and some friend-time. So lots of leftovers to bring with me to Guyana! I loved your Eid experience! Unfortunately, we dont do much cooking here for Eid, but my grandmother used to when I was little. Some day I hope I could teach my kids to cook like you girls on Eid Insha allah. assalamu ‘alaikum Nabilah and welcome!